For about 40 years now, the Surface-Forces-Apparatus (SFA) is a well-established technique to measure distances, normal or friction forces between interacting surfaces across fluid media1-4. It was the first method to directly measure and quantify nowadays well-known interfacial phenomena like Van-der-Waals forces, hydrophobic forces, hydration repulsion and electric-double-layer interactions. Figure 1: Silver-mica-liquid-mica-silver interferometer. White light is guided through a contact of two apposing transparent muscovite single crystal surfaces. Both surfaces are coated with a semi-transparent mirror at the backside (45 nm thickness), which serves as interferometer to measure the distance D between the apposing surfaces, as well as distance changes. The principle is based on whitelight-interferometry. Figure 1 shows the classical setup, where two interacting transparent muscovite (mica) single crystalline surfaces are apposing each other. Both surfaces are coated at their backside with metal mirrors (in this case silver) forming an interferometer, where only specific wavelengths (the ones which form standing waves in the gap between the two mirrors) can constructively interfere. 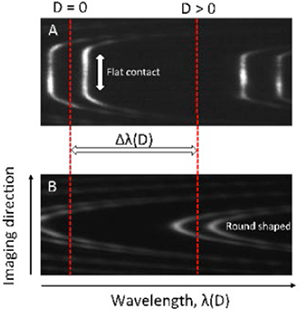 To analyze these wavelengths, the transmitted light is guided into an imaging spectrometer, resulting in the so-called fringes of equal chromatic order, FECO (Figure 2). These FECO are recorded by a camera, and depending on the study frame rates of up to 50-100 fps are desirable. As a side note, in principle the setup can also be used in reflection mode, where only one surface/ mirror needs to be semi-transparent. Here we discuss a transmission mode experiments. The position of the two opposing surfaces can be controlled via a piezo crystal or a motor-driven micrometer very accurately. The transmitted wavelengths can be translated into a surface-surface distance, D by establishing a contact in air and measure the wavelength shift of the current position compared to this zero position, where the two surfaces are in contact. This method is able to determine distances with a resolution in the range of sub-Angstrom. In order to measure forces, one of the apposing surfaces is typically mounted to a spring, which deflects and hence provides a measure for applied forces and pressures. In a typical force versus distance profiling experiment shown in Figure 3, the acting force is determined by approaching the apposing surfaces with constant speed and each deviation from the approach speed reflects an acting force (repulsive if the surfaces approach slower and attractive if the surfaces approach faster compared to the set approach-speed). In this application note, we measure interfacial forces between two atomically smooth mica surfaces across the ionic liquid 1-ethyl-3 methylimidazolium-bis trifluorosulfonylimide (EMIM BTI) using an SFA2000 from SurForce LLC. To analyze the transmitted light we use the Andor sCMOS camera ZYLA-5.5-CL3 connected to an Andor Shamrock SR-500i-B2-SIL spectrograph. 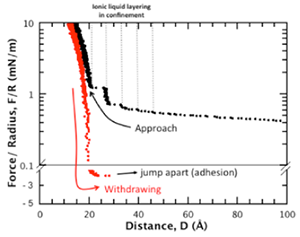 Figure 3: Typical force-distance profiles for a symmetric mica-ionic liquid-mica system showing the layering of an ionic liquid between tow apposing mica surfaces during approach. During approach individual stable layers of ions are squeezed out of the confined region, leading to this typical non-monotonic force profile. During withdrawing of the surfaces stable adhesive minima can be detected. The distance resolution shown here is about 0.5 Å, the data is not smoothed. 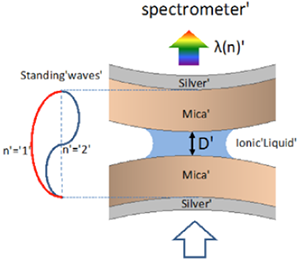 Figure 3 shows force-distance measurements for a silver|mica| ionic liquid |mica|silver interferometer. This symmetric mica|mica system shows a layered force profile when the surface-surface distance becomes smaller than 4 nm. Ionic liquids are well known to form ordered structures at mica surfaces, which leads to the layered force-profile, if two such surfaces approach each other. One step is related to one layer of ordered ionic liquid, which is squeezed out of the gap between the approaching surfaces. With our setup layering events in the range of sub-Angstrom can be resolved in great detail. In summary, the used setup provides detailed information about molecular layering of liquids confined between two surfaces. The setup can be extended to study electrochemical interfaces5, friction and properties of thin lubricating layers during sliding of two surfaces past each other, as well as adhesion and other interaction forces in bio- and materials systems including molecular recognition.